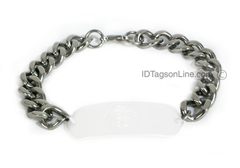 Wide Stainless Steel Bracelet chain (.4 or 10 mm wide). This wide Bracelet chain, IDRBST40 (size .4" or 10 mm wide) is made from premium grade Stainless Steel, highly polished and featured with lobster clasp. Bracelet chain is guaranteed to be rust free for the life. Please choose correct length of the chain and select, if length includes ID plate or NOT.